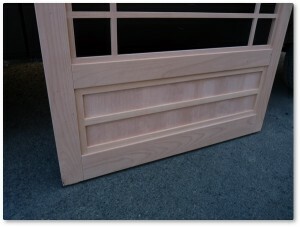 Typical size: 2-1/4″ wide x 1-3/8″ thick. Heavier sizes are available. 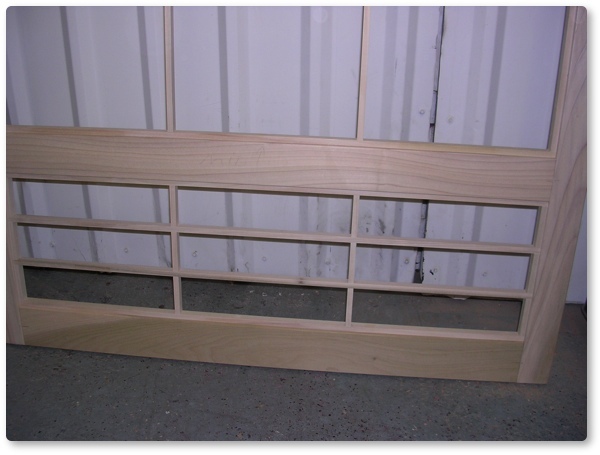 5/8″ x 3/8″, single or 3/8″ x 3/8″ double-sided, totaling; 3/4″ plus thickness of insert material. 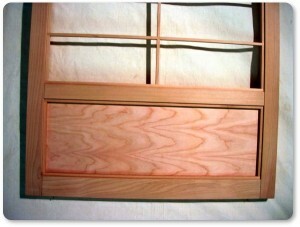 Traditional Kumiko are one sided, Western style is seen from both sides, thus the smaller kumiko pieces. A typical question: Can the Kumiko be seen from both sides and does it matter if you see the back of a one-sided Kumiko? 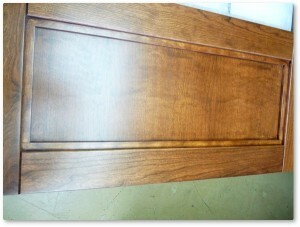 If it’s a closet, you will only see one side and that will keep the cost down. The synthetic insert is stopped in on the back with a 3/8″ x 3/8″ piece. Paper is only glued on with a water-soluble glue. Proportioned to Kumiko size, usually made of the same wood as the frame and Kumiko. 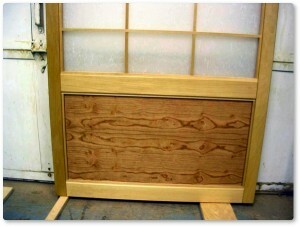 Available on most styles of Shoji screens. 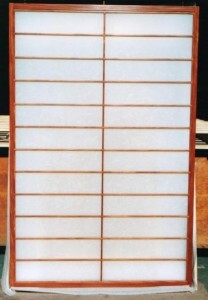 Traditional Japanese-style Shoji screens have a paper applied with sticky rice glue. Traditionally replaced for the New Year or other holidays. The rice glue makes this easily done as it softens and releases when dampened. Loose rice paper is easily tightened with a water spray (plant mister) bottle and electric hairdryer. You can also just place them in the sun or very warm room. le. Plus a laminated paper that is waterproof but not as light translucent. All are imported from Japan, these all look like traditional shoji paper but are very strong and last for years. All are washable. They’re not cheap. Shipped to me directly from Japan. These are made by the same company who has made Shoji paper for centuries. One of these is 2.0mm thick (approx. 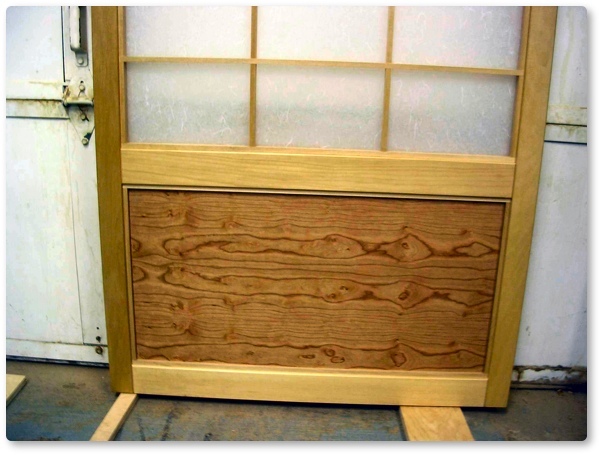 1/16″+) and would be great in light fixtures, outdoor installations, bathrooms, kid-proofing or used in a high-traffic door. The 2.0mm comes in white and off-white. The second is 1.0mm and looks the same as the 2.0mm but it’s thinner. Pretty much unbreakable and is in 85% of the Shoji I build. This works super good in almost all shoji. 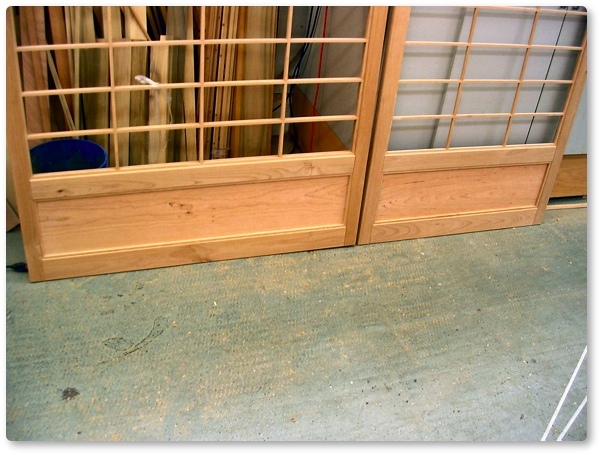 Except: Shoji with large open areas in the grid doesn’t work too well as this is flimsy (the 2.0mm is stiff). The PVC coated (laminated) synthetic paper is .45mm thick (less than 1/32″). This is perfect for closets where light transference isn’t an issue. It is a little plainer looking (without the little white hairs) but is very strong. It is also great for budget minded shoji since it comes in a roll and ships cheaply. 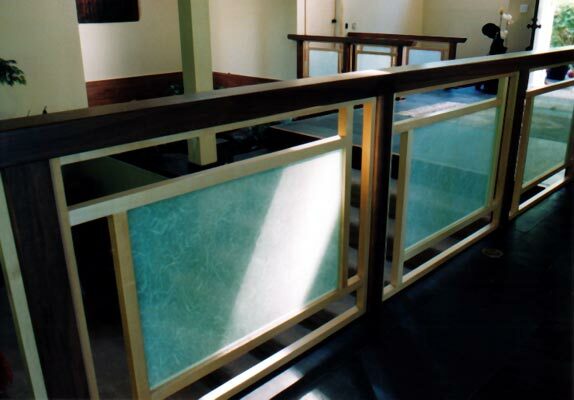 Also available is regular glass (tempered) with a peel off film applied (much like a tinting film) that is permanently adhered to it. Looks just like the others and is used indoors only. 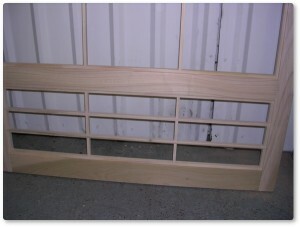 Samples of insert material on request. Safety glass that meets ICBO code and looks like rice paper is now available! 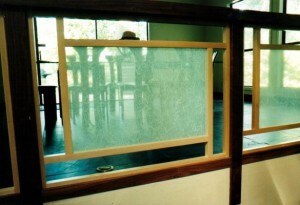 The rice paper is sandwiched between the two layers of glass. It must be special ordered and cut for each screen. Price averages $35 per square foot plus and is very heavy (approx. 1/4″ thick). 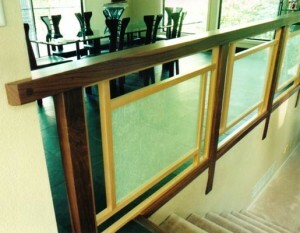 This works well for doors and below handrails. This glass is imported from Japan. (See photos below.) 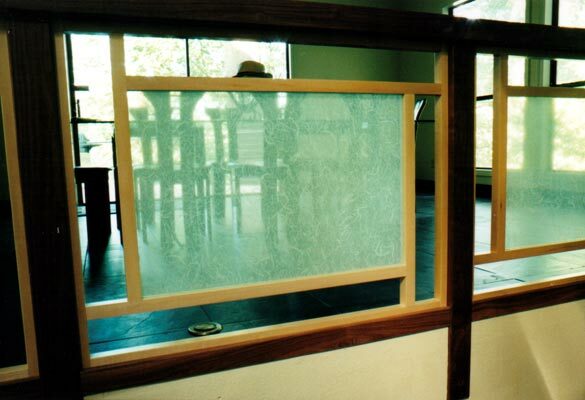 Please note: I only sell Shoji glass in my screens. I’m not a dealer for the glass. Made to your specs. 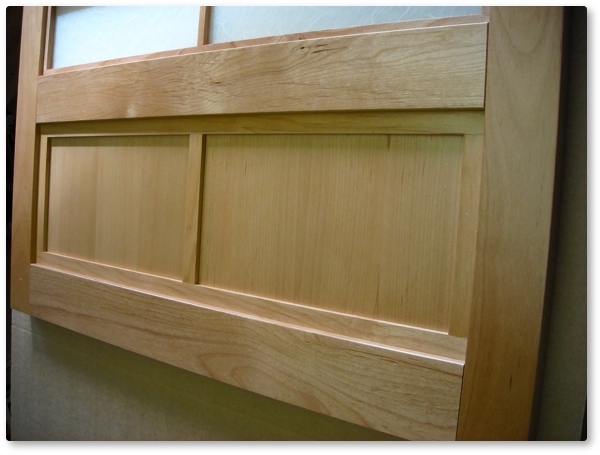 Typically, jambs and trim can be made to match the screens or the hardwood track. 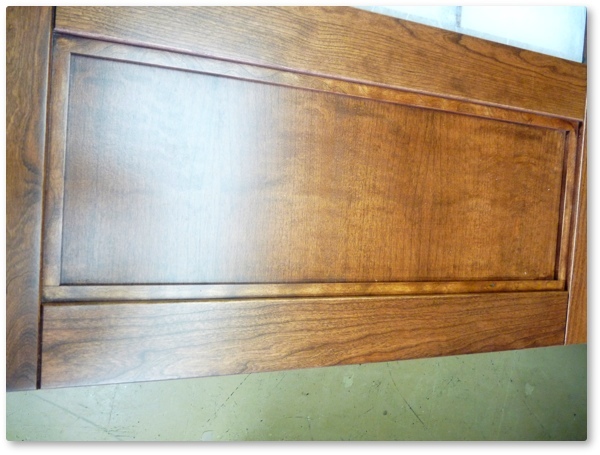 These parts cost extra and really add the the finished look of any job. 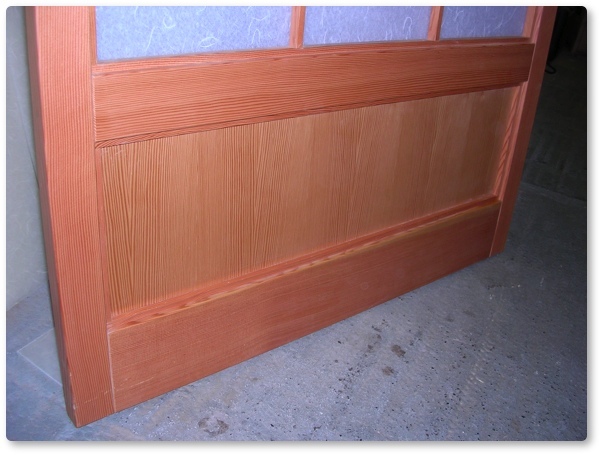 If an opening needs to have three doors and it is a typical 2×4 construction wall (approx. 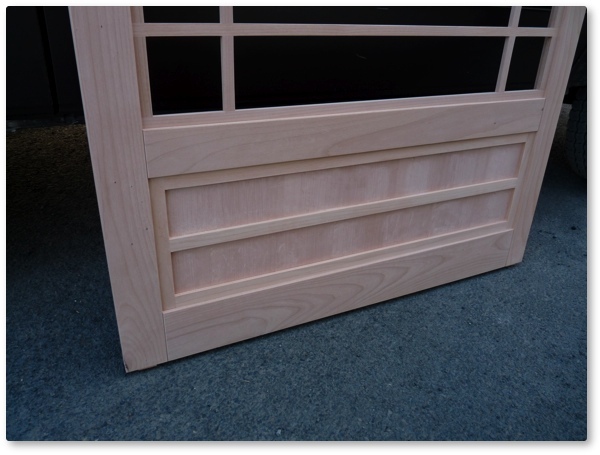 4-9/16″ thick), the jambs would need to be replaced with ones that are no less than 5-1/8″ wide (utilizing the trim to be the valance) and probably need to be 5-7/8″ wide (allowing for a 3/4″ valance to hide the metal tracks). Please email me for more detail on this. I have done hundreds of these and have it down. I can send you images and drawings of how this is done.